This is perhaps the most famous dive site on the Great Barrier Reef. Located east of Lizard Island and about 203 kilometres due north of Port Douglas, this site is at the far northern end of Ribbon Reef Number 10. 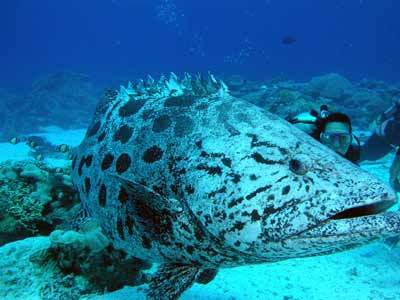 This dive is famous for its potato cod which are both huge and sometimes numerous. The mooring for the dive site is located on a bommie at about 10 metres. The GPS Reading for the mooring is S14° 39' 50.0" E145° 39' 48.4" WGS84 as datum. The normal dive is based on the mooring which is around the western side of the point but you can also do it as a drift dive if the current is incoming. The start of the dive is just outside the entrance to the lagoon. The entrance is called Cormorant Pass and is between Cormorant Reef and Ribbon Reef Number 10. It is due east of Lizard Island. You get dropped off just outside the entrance and immediately drop to the reef. The depth here will be about 20 to 30 metres and you will be heading due west. You should try to stay at about 20 to 25 metres at first (as you will see soon). The reef here is composed of a lot of small coral outcrops with some nice gorgonias as well. The wall slopes up fairly gently to the main reef top. After a few minutes you will see that the deeper section of reef heads west or even north-north-west while the main reef turns to the south-east and then south. Where this reef splits off, there is a sort of saddle between the offshoot and the main reef. 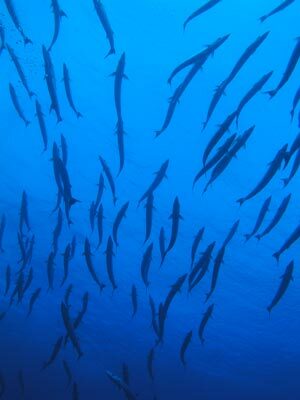 All along this section we saw hundreds of barracudas. They came in a number of schools, one was huge. We also saw a few white-tipped reef sharks and some other pelagics. As soon as you head south, look for potato cods. 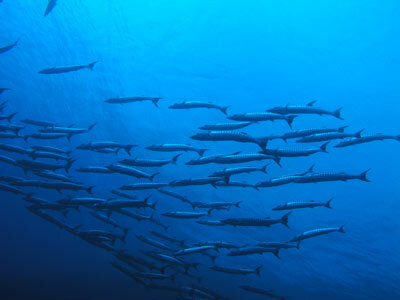 It is said that there used to be dozens of the them at the Cod Hole but in more recent years (since feeding them was prohibited), numbers have dropped back to about half a dozen. 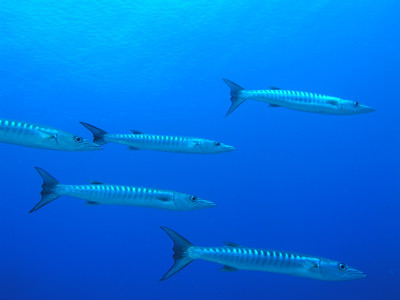 However, in November 2006 when I dived here we saw six in one group and then another and back at the mooring, a few more. We estimate that we saw about 12 to 14 potato cods on this dive. Right next to the first mooring you encounter keep an eye out for a very friendly potato cod. One of our group was stroking its nose. See the photos. The depth here is about 25 metres. After you leave the mooring, the depth comes up from 25 metres to about 12 metres within four or five minutes if you stay near the reef edge. It keeps getting shallower (to about seven metres) if you stay close to the main reef so head out west along the sand patches between the large bommies. You will get back to about 15 metres and then 20 metres. In this area look for more potato cod, sharks, barracudas and pelagics. Some of our group saw a bull shark (one of the most dangerous sharks in the World) and got very close to it indeed. Follow this and you will soon see the mooring where the boat will be moored. Spend the rest of the dive in this area. Shallower there is the main reef and some smaller bommies. 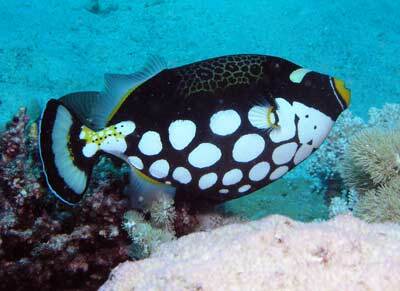 You may see clown-triggerfish in this area. 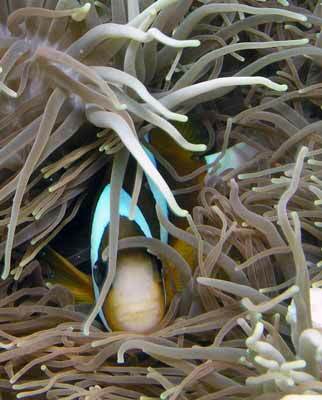 There are lots of other fish to see including clownfish, red bass and red-finned butterflyfish. A fantastic dive site, one of the best you will do anywhere in the World. Visibility was in excess of 40 metres and water temperature about 25 degrees in November.